Welcome to May and while the daily papers are full of General Election coverage our monthly tasks do not change and thus we have the latest round-up of broadband speed tests. After a number of months of splitting out high-volume and low-volume providers we have combined them into a single table to make comparisons easier. If your provider is missing most likely we did not have enough tests from enough locations to have useful statistics so run a speed test. Remember particularly for the smaller providers, they may appear some months and not others, so a quick mention goes to providers like Gigaclear - 127 Mbps, B4RN - 171 Mbps, Wessex Internet - 34.9 Mbps (mean download speeds). The web based speed test has been recording latency performance for the last few months while the download and upload tests are underway and we have just made the results visible for individuals after the test. The purpose of this new test is to illustrate buffer bloat problems, which are often down to very large buffers in consumer routers with the large buffers causing problems with the TCP/IP protocol such that one user/app can dominate the connection, we will blog more about the results in a few days. Put simply though, if your speed test comes up as grade A for buffer bloat then a web user is likely to happily co-exist with a video stream that otherwise fills the connection. As usual to help people track the ups and downs of the main technology types, we have split out the ADSL/ADSL2+ and FTTC/cable speeds. We only split the different technology speeds for the largest providers where the sample size is large enough to ensure a reasonable mixture representative of the UK. 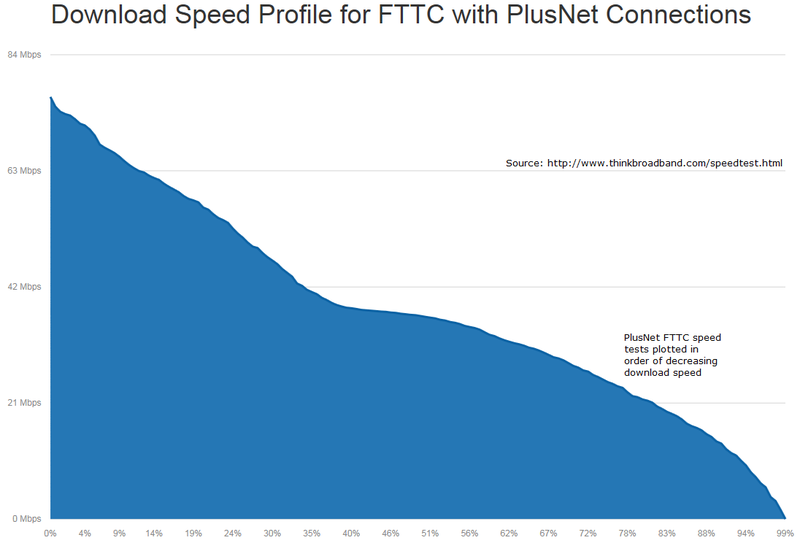 The mean upload speed for PlusNet being lower than the median may look unusual, but if you look at the distribution of results there is no particular plateau so we can expect the mean and median to shift around each other each month. The download profile shows a lot of users on the £19.99 up to 76 Mbps service, with the capping for the cheaper £14.99 Fibre service very evident, suggesting that for a good many the extra speed available is not worth the extra £5 per month. With our mobile compatible speed test that has been gathering data now for over eight months we can also say that while mobile devices are increasingly used for web access, if you want the best experience a PC is still best, for BT users the average PC speed test in April 2015 was 26.5 Mbps, on a mobile phone 21.5 Mbps and a tablet 18.3 Mbps, on other providers mobile phones also appear to out perform tablets overall. A chunk of this difference is the Wi-Fi capabilities of the router and device, though of course some of the PC tests will still be Wi-Fi based. 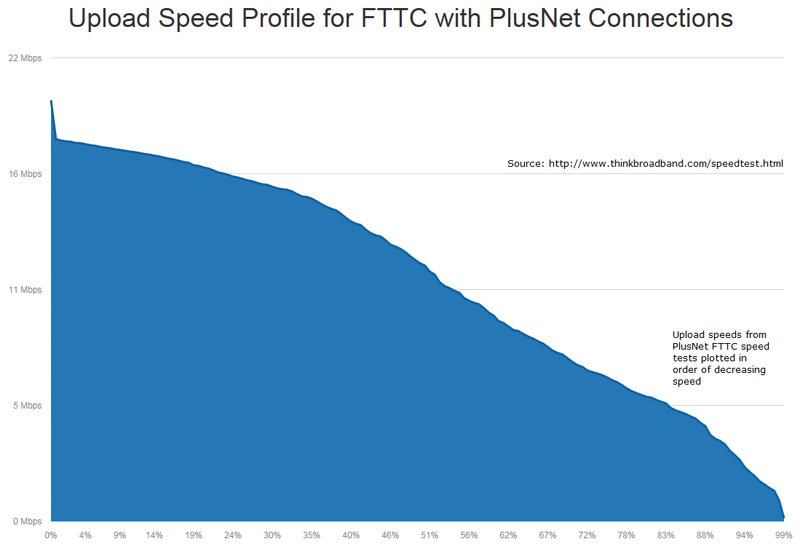 If the proportion of mobile devices continues to climb we might have to filter the overall results, we are seeing tablets and phones hitting the maximum speeds of the FTTC services, but overall we see around 1% of phones with results over 90 Mbps (70 Mbps for top 1% on tablets). Don't forget you can look at where the fastest speeds are on both our maps and also our broadband availability checker which will do the maths for you based on your postcode, and show the average speed test in your area along with the weekly updating levels of fibre coverage. I am not sure what these tables tell us, as the median speeds will vary with the profile of the customers packages and their distance from cabinet and exchange for each ISP. Is there no data for us poor unloved rural folks that are still lumbered with ADSL/ADSL Max? Mean speeds still flipping around 5 and 6 Mbps for areas with IPStream Max only (which is less than 4% of UK) Median download varies 3 to 4 Mbps over the months. If these results ever included TBBx1/HTTPx6 as a %, broken down into peak and off-peak, they would suddenly become mighty interesting. Did do that ages ago and it did not set the world on fire so stopped worrying. Its like mean and median, most people using the information just want the higher of the two figures - usually mean. Is there a significant difference in the single vs multi threaded mean/median results for fibre? It would be interesting to know if there is variable performance amongst the ISPs.